No matter how far your brother you can always connect with him. Send Rakhi to Saudi Arabia hassle-free with us. 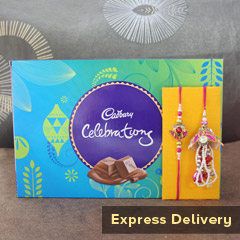 We ensure that you can send amazing Rakhi gifts to your brother right on time without any issues. Be the beacon of light in your brother’s life this Raksha Bandhan by sending him a beautiful Rakhi through our delivery. Not having your brother with you on the occasion of Raksha Bandhan can be upsetting for both you and your brother. We have brought an amazing collection of Rakhi gifts with us through which you can uplift the mood of your brother on Raksha Bandhan. Send Rakhi to Saudi Arabia and bring joy in his life. He would appreciate you for the thoughtfulness and love that you have shown even by being so far away from him. We conduct Rakhi delivery to Saudi Arabia and many other places so distance is not a big issue anymore. You can easily choose the online Rakhi that you want to give your brother and order it. There are numerous combos of Rakhi gifts that you can give your brother on this auspicious day. You will find assorted chocolates and many other branded chocolates that your brother loves and send them to him along with a beautiful Rakhi. There are Rakhis in different colours and designs. Choose the Rakhi of your brother’s favourite color and gift it to him.